Intense levels of high frequency acoustic energy, or high power ultrasonics, have found practical use in many industrial processes, of which cleaning, welding and drilling are well-known examples. Other applications include metal forming, treatment of molten metals, chemical processing, and even therapeutic and surgical uses in medicine. In most industrial applications, high power ultrasonics involves power levels of hundreds to thousands of watts, and ultrasonic systems operating in the frequency ranges from 15 kHz to 100 kHz. Typical amplitudes range from about 10 to 40 microns. An ultrasonic system operating at 20 kHz could create a cyclic acceleration in the range of 40,000 g (acceleration of gravity). One of the promising directions in using of high power ultrasonics for industrial applications is the Ultrasonic Peening (UP) of materials, parts and welded elements. The UP technique is based on the combined effect of the high frequency impacts of special strikers and ultrasonic oscillation in treated material. A number of projects were completed for evaluation of the efficiency of Ultrasonic Peening (UP) technology for treatment of wires to improve the quality of surface and material texture, to redistribute the residual stresses and to produce thin tape from wires. Such tapes have improved mechanical properties and could be used, for instance, in tire production and other applications. In the conducted projects the efficiency of UP treatment for relieving of the harmful tensile residual stresses and fatigue improvement of wires with diameters starting from 0.15 mm was evaluated. The Illustration to the right presents a schematic view of the prototype system WireTreat™ designed for treatment of wires. The three images below show the general view of the Mark II WireTreat™ (patent pending) system and its blocks. The system includes a universal ultrasonic generator, specially designed ultrasonic transducer(s) and a wire delivery system that includes a feeding and a collecting drum. A number of wire samples with different diameters and/or coatings were subjected to UP treatment in the WireTreat™ system using different technological parameters of the UP process. Positive results were achieved in increasing the fatigue life of the treated wires. In general, according to experimental data, the harmful tensile residual stresses on the surface of wires of small diameters (up to 0.9 mm) may reach levels from 200 MPa to 500 MPa. The results of residual stress evaluation as well as fatigue testing of wires with different diameters confirmed that UP treatment of the wires caused a significant relaxation of harmful tensile residual stresses and fatigue life improvement. 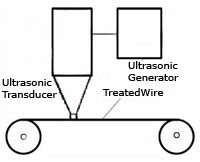 A number of enabling R&D projects were completed to evaluate the efficiency of application of Ultrasonic Peening (UP) technology for treatment of wires to improve the quality of surface and material texture, beneficial redistribution of residual stresses, fatigue life improvement and production of thin tapes from wires. Such tape has improved mechanical properties and could be applied in tire production. A certain range of wire diameter was considered starting from 0.15 mm. Based on the preliminary experimental results, the Ultrasonic Peening is considered asa promising technique for beneficial redistribution of residual stresses in wires and fatigue improvement. The main critical point in UP treatment of wires is thedevelopment of the optimum technology: minimum cost-time-labor with maximum speed and beneficial effect. The UP process could be applied on line in combination with high-speed wire drawing.